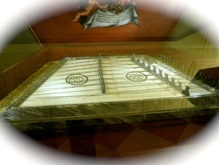 The Hammered Dulcimer originated in the Middle East, possibly as the Persian Santir, and is an early ancestor of the piano. It was known in Spain (Salterio) by the 12th century and by about 1800 had reached China, (Yangquin, meaning “foreign zither”). In the late 19th century, the dulcimer is found as a folk instrument, for example, the Swiss Hackbrett, the Czech Cymbal, and the Greek Santouri. Also at this time, the Hungarian dulcimer, the Cimbalom, developed into an elaborate, fully chromatic instrument on four legs with a piano-like damper pedal. It even made its way to the Sears Catalogue in 1920! The Hammered Dulcimer is played by striking the hammers (mallets) on the course of strings one wishes to play, although in some cultures, the strings are plucked with the fingers. Most recently, a miniature bow has been developed to create yet another sound. 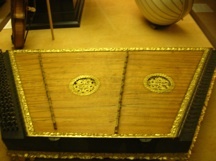 The strings pass over bridges and are attached at the sides of the trapezoidal shaped wooden box. The hammered dulcimer is set up for you to play scales. A contrasting color bridge cap usually marks the start of a major scale. Commonly, most dulcimers have a D, G and C scale, and their related minors. 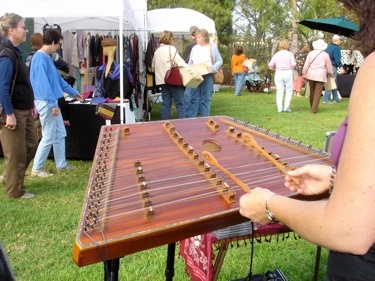 The hammered dulcimer lends itself to many types of music and will bring you hours of enjoyment.